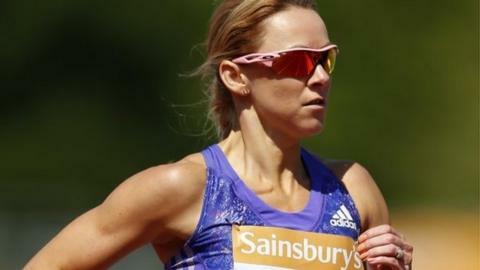 British 800m runner Jenny Meadows has admitted feeling very "demoralised" over the current doping crisis. The 34-year-old from Wigan admits to having doubts over whether she is racing on a level playing field with the recent revelations in athletics. "You can suspect a couple of people in your event and it's turned out that I have been right," she said. "You just don't think that it would happen on a mass scale like that. It has been very, very demoralising." Meadows has been affected by the actions of cheats during her career and was only awarded her 2011 European Indoor Championships gold medal after the event, when Russia's Yevgeniya Zinurova was banned for tampering with urine samples. She has also said she has been cheated out of at least three medals. The recent allegations of doping in athletics made by the Sunday Times and a German broadcaster have led to the IAAF suspending 28 athletes as a result of suspicious findings in doping tests. Last week's Sunday Times claimed that athletics' governing body, the IAAF, blocked publication of a study from the University of Tubingen in Germany which showed as many as a third of the world's top athletes admitted violating anti-doping rules. The study had concluded that 29%-34% of the 1,800 competitors at the 2011 World Championships had violated anti-doping rules in the previous 12 months, although the IAAF disputed the findings. Meadows admits looking at races sometimes and questioning whether it is achievable to win. She missed out on a place in the 800m final at the World Championships in Daegu, South Korea, four years ago only to see two of the Russian athletes in that final, Ekaterina Kostetskaya and Yuliya Rusanova, since serve doping bans. "It is very annoying and I am very, very proud of my athletics career, but a lot of those performances and races could have been a lot different," said Meadows. "I could have quite a different record of achievement to what I've had and it totally would have taken me to a different level of athlete. "I wouldn't say I feel bitter, but I definitely feel a mixture of frustration and anger."